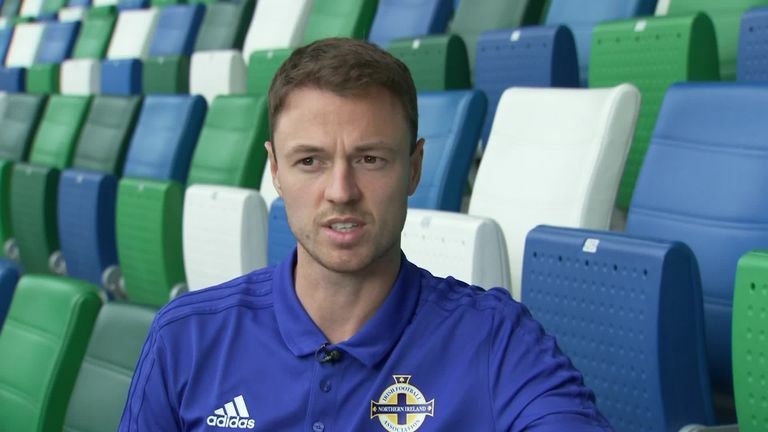 Leicester City defender Jonny Evans says he feels frustrated with a lack of game-time at his new club, but admits in-form Harry Maguire deserves his place in the team as well as a new five-year contract. Since arriving from West Brom for £3.5m in June, Northern Ireland international Evans has made just one appearance for Leicester City this season. Meanwhile, England centre-back Maguire penned a new five-year contract at the King Power Stadium on Monday, which he feels is a reward for a good season and a successful World Cup campaign with the national team. Evans told Sky Sports News: "I've not maybe played as many minutes as I would have liked but I'm experienced enough to know that the best way to get in the team is by playing better. "I can take the performances against Israel and the game tomorrow night to try and improve, that's always the challenge for any player." Despite his lack of minutes, Evans praised his Leicester team-mate Maguire on his recent performances for club and country which have earned him the new contract. "You could sort of tell that that might happen. You can tell he loves the club," Evans added. "He's been playing very well for the club over the last year, he's gone on to play for England and has been fantastic. "I think when things are going well in your career like that it's important to keep that stability in your game. He's done the right thing and already all the lads are texting him saying congratulations." Maguire played the full 90 minutes in England's 2-1 defeat to Spain at Wembley on Saturday. Leicester team-mates Demarai Gray and Ben Chilwell could make their first senior national team appearances in England's international friendly against Switzerland. Watch England v Switzerland at Leicester's King Power Stadium live on Sky Sports Main Event from 7pm on Tuesday.